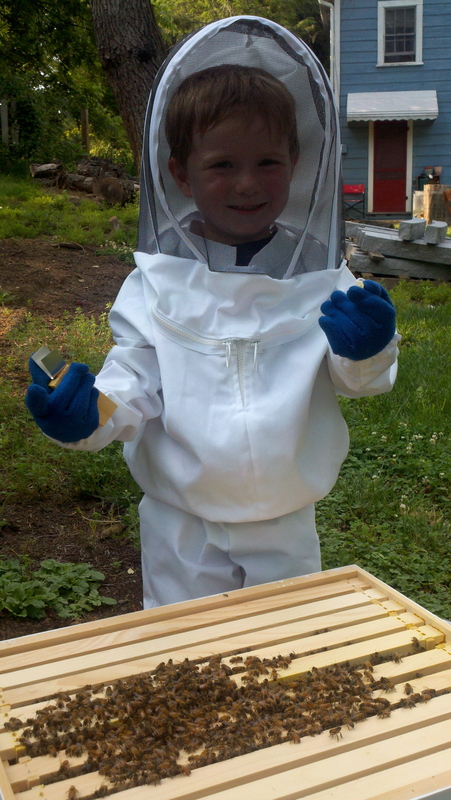 Since we got our beehive last month, our older son has been asking if he could get a “bee suit” too. 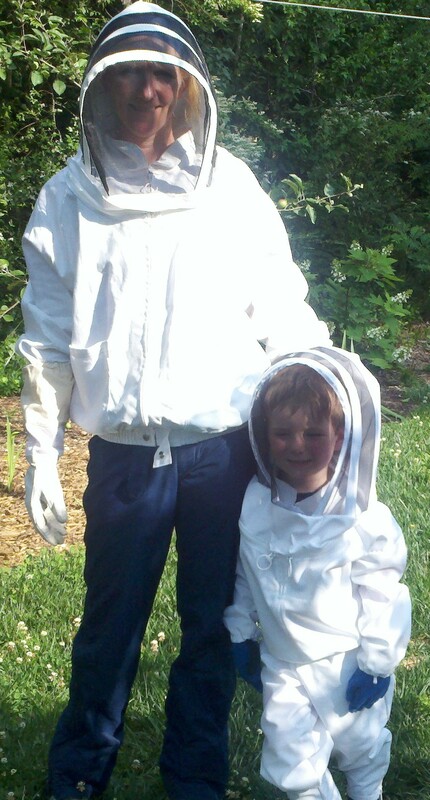 Sure enough, I googled around and found many beekeeping suppliers who sell beekeeping suits for kids. 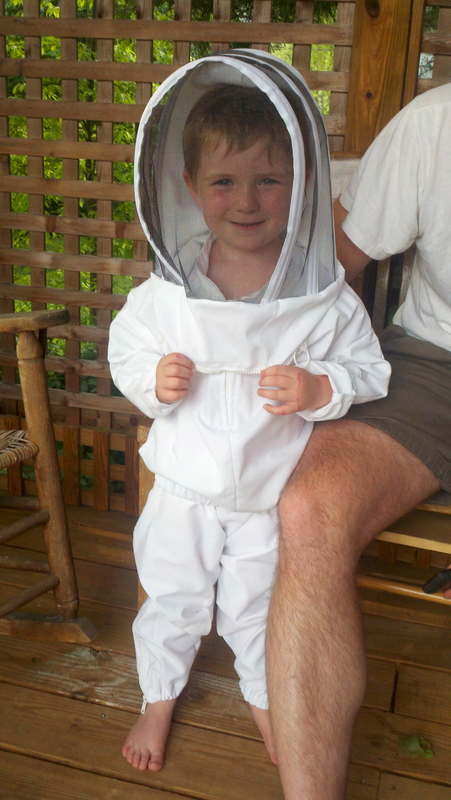 Now, although he was fully suited and protected, I was still a little worried about him getting stung somehow. However, he was not actually “working” in the bees, and we weren’t opening up the hive to check on them, so he was safe from getting stung, and was elated to have been able to get close to the hive and see the bees up close as they traveled in and out of the hive. A few days later, we went to my husband’s cousin’s house to check on their new hive. My brother had installed the hive along with a new queen, but he was out of town and couldn’t check to make sure the queen had been released from the little box she’d been delivered in. There is a wall of solid sugar on one end of the box that the bees eat to release the queen. Sometimes (rarely) they won’t have freed her so the beekeeper has to help the process along. This was my first attempt at checking on a hive without someone else’s help, but my brother assured me all I had to do was take the top off the box, find the queen box and make sure she was out. The bees had already filled out several of the racks, and we were even lucky enough to see the queen — my boy was so excited you’d have thought he’d had seen an ice cream truck the size of an 18-wheeler. The queen had made it out of the box and was busy laying eggs in the new cells. Today, we went in our own hive along with my brother. It was just about an opposite experience from the one I just described. The bees have been so productive in the past few weeks that they have almost filled up all the racks with honey and brood. We were really excited to see how much honey they’ve made, and how many brood cells there are. Well, it was really hot – of course that’s compounded by being in full bee suits – and we were in the blazing sun with no shade. My brother told my son to put his hands by his side, and not on the stand the bee box is on. Well, not a minute after that, I looked at my son’s fleece gloves (gloves weren’t included with the bee suit, and there weren’t any to order in his size). There were a few bees starting to land on his gloves, and they were not happy. I’d heard that bees don’t like dark colors. Well, it turns out they don’t like dark colors that also happen to be fuzzy (like fleece) — kinda reminds them of bears. My brother calmly got my son away from the hive, brushed all the bees off his gloves, and called to me to put the top back on the box (by this time the bees had sent out some kind of signal that danger was nearby, and they were agitated). I was so hot and trying not to panic — I was worried for my son with those bees landing all over his gloves– then as soon as my brother got the situation under control I realized that I had to put the bee box back together quickly and I was getting nervous because there were suddenly lots of bees in the air around me. But I got it done, then ran to make sure my son was OK, and he was totally unfazed, no stings — but a little cranky from being just as hot and sweaty as we were (and his bee experience was cut short and he wasn’t sure why). I called a local beekeeper/supplier this afternoon as soon as I’d recovered (and wasn’t about to fall out from heat stroke), and told him I needed some child-sized gloves. He’s got them in stock and we’re going tomorrow morning to get them. 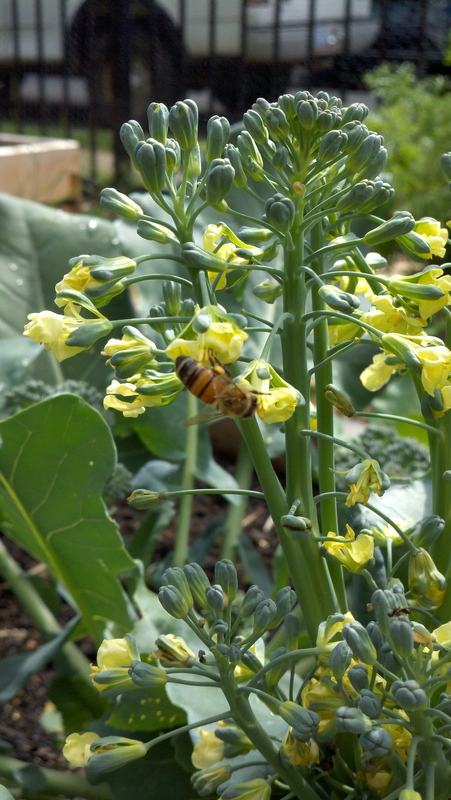 I also told him what happened today, and he said, “Oh yeah, bees really don’t like fuzzy…nope, they don’t like fuzzy at all.” No more fleece for us. That’s right. Start ’em young! I envy people who tell me that one of their parents raised bees when they were a kid. He’ll be like a magician around bees!